Abby, has Down syndrome, but that hasn’t hindered her accomplishments. In addition to being Value Partners’ Office Manager, Abby has her own business as a Thirty-One Consultant. She works and volunteers in a number of settings such as hospital Respiratory Therapy, a Wellness Center, Athens Tourism Office and her local United Way. She also serves on Goodwill Industries’ Board of Trustees and as an Ambassador for The Athens, Texas Chamber of Commerce. She absolutely loves working and volunteering. Some of her duties include, participating in presentations, preparing documents on her computer, copying, filing, shredding, assembling mail-outs and interacting with people. 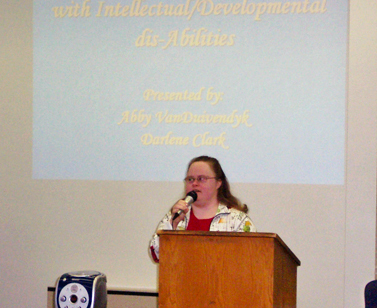 Abby is shown above presenting to professionals from around the world at the Robert S. Hartman Institute in Knoxville. She and Darlene shared the work they have done using the pictorial version of the Hartman Value Profile. Their focus was on using this unique tool to help level the employment field for individuals with intellectual/developmental disabilities. Since earning her high school diploma, Abby has taken several college courses. 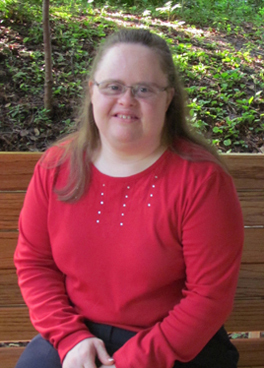 She is also energetic and athletic, having earned dozens of medals in a variety of Special Olympic events such as Bowling, Softball, Basketball, Golf, Swimming and Track & Field. Abby’s strength of character and her caring, compassionate side serve her well in moving forward toward the goals she has set and has still yet to discover. Abby’s presence is calming…she enjoys serving people and meeting their needs. Abby has a special gift of being able to unconditionally accept and love everyone as unique individuals. Helping other people and adding a bit of sunshine to their lives with her smile and genuine caring brings Abby personal satisfaction. These intrinsic strengths are genuine expressions of who she is as a person.